There are certain deal providers that I would love to run deals with every day if I could. Tom Anders is one of them. Tom's Photoshop actions are far and away the absolute best that I've ever seen, and if he keeps pumping out new ones at this rate, his fans are going to have a full collection and empty wallets. You were huge fans of his first deal, and this one is even bigger and badder (in the good way) than before! PRO TIP: Make sure you check out this week's video at the top of the page to see exactly how quick and easy it is to use these actions! If you're unfamiliar with Photoshop actions, let me enlighten you. Sometimes you spend hours on a single photo or design to get the right look, including adjustments to color, sharpness, curves, levels, saturation, and more. You can come up with some awesome looking work, but there's two problems with working on each file manually. Or can you? Photoshop actions let you record every change and adjustment you make so you can play them back later on another file. Even better, actions can be exported and shared with others, like you! When you buy these actions, you're essentially getting all the hard work of a professional photo retoucher for a tiny fraction of the cost. Tom spent countless hours on each of these 116 actions, and all you have to do is download them, hit play, and look like a true pro. There is a total of 116 actions in this deal, and they're split up into themed packages. Need to convert that dull lifeless photo into a stunning, creative shot? Are you looking to convert a color photo to silky black and white? How about making every hipster on the street jealous with great vintage effects? All of this and much more is possible with this incredible library of actions. There's much more to a quality vintage look than simple color and saturation changes, like texture, split-toning, and lighting effects. If you're familiar with the work that goes into creating vintage photos, you know how much time you're saving with this deal. If you don't know what any of the terms above mean, trust me, you're going to save even more time the people who do. Different photos call for different actions. A beach scene might look best with high contrast and saturated colors, while an alpine landscape would not. This bundle is perfect for any photo, whether your subject is sitting in a wheat field or against wooden backdrop. If you're going for an ethereal or airy look, this pack is a winner. The effects included in this bundle are hard to describe, but quick to impress. These actions cover everything from HDR and retro looks to pencil sketch and comic book effects. If you want to get creative, this bundle is a great place to start. No Photoshop actions deal is complete without some settings for black and white. Whether you need something silky smooth or with deep contrast, these actions have got you covered. On top of all these actions, you'll find some awesome extras in the Vintage Bundle folder to take your photos even one step further. This deal also includes 6 high-res textures, and 10 different light leak overlays that you can use to create your own custom works of art. If the preview images above don't convince you, then maybe the price will. 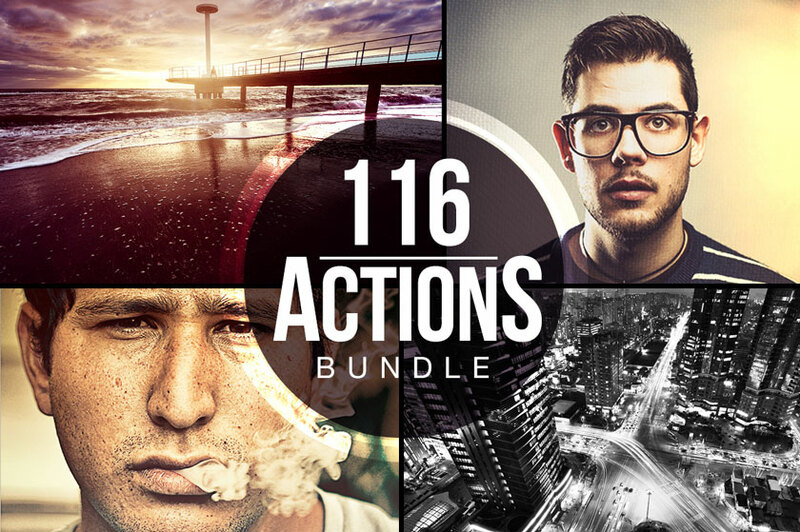 Normally, all 116 of these amazing Photoshop actions are a steal at $30, but for this week only, you can get the entire collection for only $15. That's 50% off an already ridiculously low price. To top it all off, this deal also includes a helpful .PDF that will walk you through installing and using Photoshop actions if you're not familiar with how it all works. These files can be used for both personal and commercial purposes. Files are delivered as an instant download in .ZIP format (31.2MB). Files are in .ATN and .JPG file formats. Photoshop CS3 or higher is required.